The Half Marathon begins at 8:30 a.m. sharp! 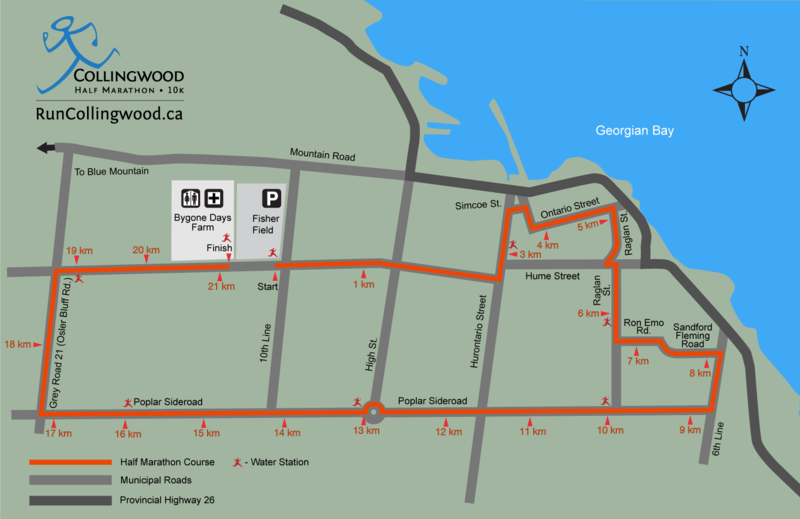 The Collingwood Half Marathon is a scenic, 21.1 kilometre race in the heart of the Georgian Triangle. 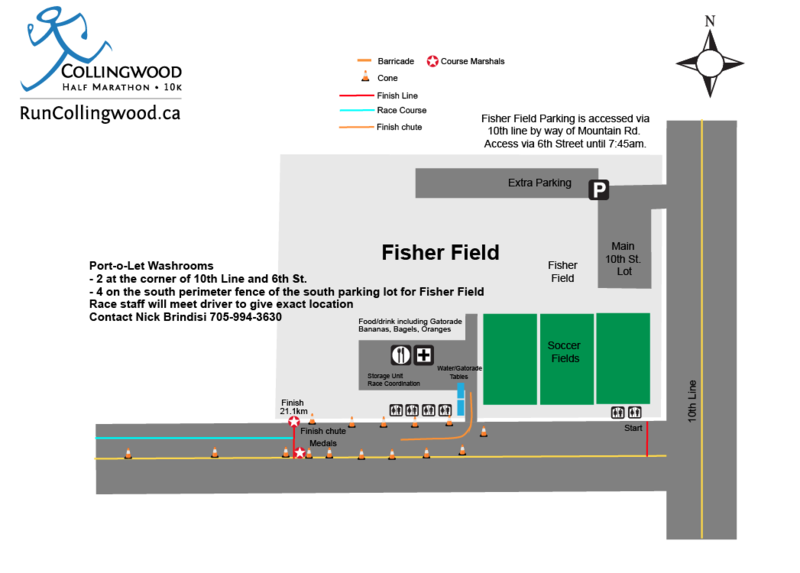 The route begins at Fisher Field in Collingwood and runs across Sixth Street and down Collingwood’s “main street”. After turning onto Ontario Street, and towards the east end of town, the race heads for the open countryside via Raglan street, Ron Emo Road, Sandford Fleming Blvd. and 6th line. After a turn to the west on Poplar Side Road, runners are presented with a spectacular view of the Niagara Escarpment in the distance. Before the 16-kilometre marker the only short, gentle uphill of the race begins. At the 17-kilometre marker, runners turn north onto Osler Bluff Road to follow the base of the Osler Bluff ski hill with very gentle rolling pavement that begins to descend to the 18-kilometre marker. After a long downhill, the race turns east on Sixth Street towards the finish at Bygone Days Heritage Village, a segment that is downhill. In the Collingwood Half Marathon you get to experience the best of the historic town of Collingwood and the open countryside surrounding the Town. The autumn colours and crisp fresh air will propel you quickly on this fast, mostly downhill course. 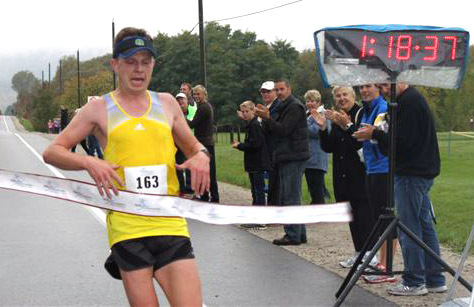 The course is surveyed and accredited with Athletics Canada Certificate # ON-2013-108-BDC. The race cutoff time is 12:30 pm. All participants on the course after 4 hours may be asked to move onto the sidewalk or shoulder and obey normal traffic laws. This 4 hour cutoff is with reference to the finish line and the course markings are removed after the trailing police car and the last runner. If you are not at the 10K marker in 2 hours or less please report this to a bike patroller, course marshal, police or at the next water station. There will be Aid Stations along the route at approximately 3km intervals, supplying runners with Water and Gatorade. The course will be marked every kilometre. All events will be timed using the BibTag timing system. Kits will not be mailed. Anyone can pick up your kit. They may be asked for identification and your confirmation number (if you registered online). Important! If you cannot pick up your bib and shirt during the times above, you can pick them up the morning of the race prior to 7:30 a.m. at Fisher Field (south parking lot). Please arrive early, as you want to make sure to get your BibTag and shirt before the gun goes off. Online registration closes Wednesday October 2nd at 11:59 p.m. You can still register on Friday October 4th by completing the offline entry form (click here) and bringing it to race kit pickup. There will be NO race day registration.